Fight mid-air boredom this holiday season with our airline entertainment guide. In the so-called “Golden Age” of 1950s–’60s air travel, in-flight entertainment options were slim. Unless you remembered to bring a novel or a newspaper, all you had to occupy your time was drinking, smoking (yes, it was a thing), and pondering your airborne mortality. In-flight movies became commonplace in the ’70s, but flying entertainment made a major, multimedia leap in the late ’80s with the introduction of the seat-back screen. The 2000s brought Wi-Fi onboard, as well as laptop, tablet, and smartphone compatibility. All the comforts of home, minus the actual comfort (except for you first-class flyers, of course). But which airline does in-flight entertainment best in 2018? CableTV.com did the research. 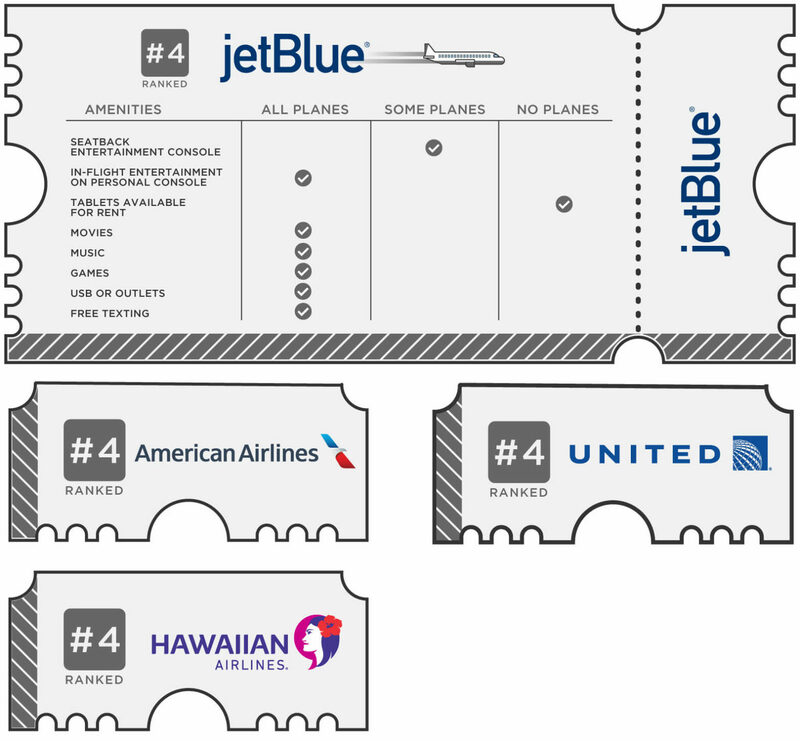 We looked at the options offered by 10 major US airline companies: seat-back consoles, personal device access, variety and pricing of movies, TV programming, music, games, and other entertainment. Then we weighed each one’s extra cost (if any) and engagement value, while factoring Wi-Fi availability (which, believe it or not, still isn’t always found on aircraft in 2018). Heard anything about Virgin America airlines lately? No, you haven’t, because it was bought and absorbed by Alaska Airlines. Alaska Airlines’ Alaska Beyond Entertainment (free to all passengers) features a stored cache of over 200 movies and TV shows that can be watched on seat-back consoles, in addition to games and music. Overall, Alaska offers a little more of everything in its on-board entertainment package. If you’re on an aircraft with Wi-Fi, you can access more titles through the Gogo Entertainment app on your personal device or a rental tablet from Alaska Airlines. A note about Wi-Fi: as of December 2018, only a small number of Alaska Airlines’ 241 planes are equipped with satellite Wi-Fi. The rest are expected to have full internet access by 2020. As you’ll find throughout this article, we believe charging extra for Wi-Fi is a sin right up there with, well, charging extra for anything while you’re trapped in a flying metal tube. That said, using satellite internet on Southwest will cost you $8 a flight—not cool. Should you decide to opt out of paying for Wi-Fi—we get it—Southwest also makes its movie and TV options available through in-cabin streaming for free. Southwest’s wide array of newer movies and live TV programming can also be viewed on your own devices via the airline’s app. To be honest, we’d recommend downloading the app of any airline you’re flying with. It makes your flight life easier. Besides a USB-charging outlet, headphone jack, and the oddly hypnotic Flight Tracker that displays a cartoon depiction of your plane flying across the states, Delta Studio’s seat-back entertainment console is loaded for a long flight. 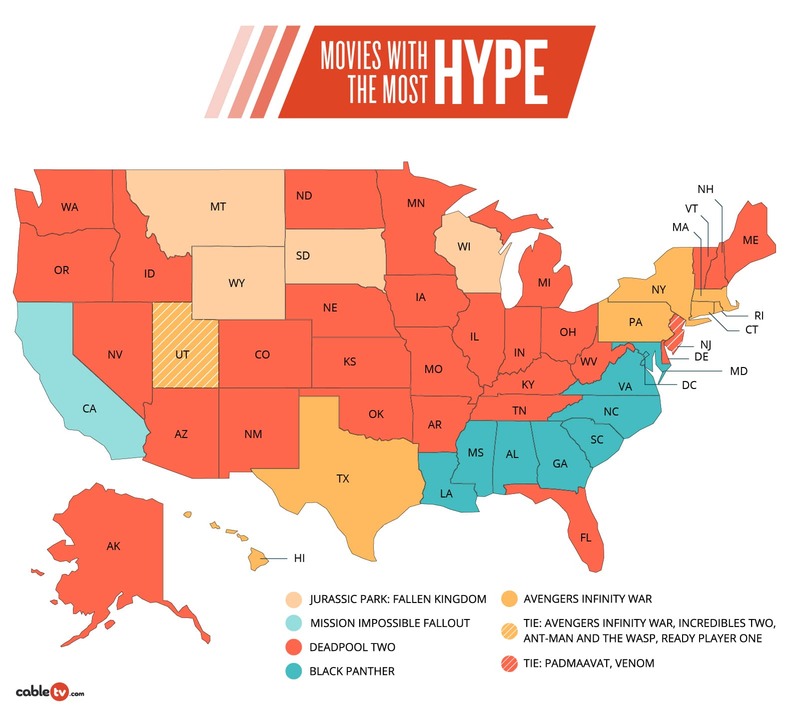 There are around 300 movies to choose from, including new releases and older favorites (don’t worry, Frozen is there for the kiddies), as well as TV content from HBO®, SHOWTIME®, and non-premium networks. Select flights also have access to a dozen live satellite TV channels, in case you don’t want to miss the big game or Rachel Maddow’s latest rant. If you’d prefer to experience any of this on your personal device rather than the seat-back screen, you can download the Gogo Entertainment app for Android or IOS and stream via the Delta Wi-Fi Portal. Both are free, but be warned: the satellite Wi-Fi, as with all airlines, is about as fast as old-school dial-up. You may want to take care of any heavy downloading before boarding. Unlike some companies that have been in business far longer, JetBlue is the only airline that offers free Wi-Fi on all of its aircraft. But there is a small catch, as its “Fly-Fi” is sponsored by Amazon, so some commercial intrusion can be expected during seat-back and personal device viewing. Still, free is free—and JetBlue’s gratis offerings don’t stop at Wi-Fi. Through DIRECTV, JetBlue provides programming from up to 100 TV networks and 100 SiriusXM Radio channels free of charge. JetBlue also has free monthly new-release movies, but the selection is far more limited: you’ll have access to only six on flights over four hours and just three on shorter trips. JetBlue is an economy airline, after all. But the miniscule movie selection (and zero games) is a serious letdown compared to its other fully-loaded entertainment freebies. As far as entertainment choices go, American Airlines’ seat-back movies, TV, music, and games choices are comparable to Southwest’s and Alaska’s. However, AA falls short when it comes to Wi-Fi, charging $10 or more for satellite internet access—which, as we mentioned before, isn’t anywhere near “fast.” Frequent flyers can choose to pay a flat $50-a-month rate for American Airlines Wi-Fi, which is almost in the vicinity of a bargain. Should you spring for Wi-Fi, you’ll also want to download the American Airlines app. In addition to handling all of your flight information, the app doubles as AA’s entertainment center, with access to all of the content of the seat-back console. It doesn’t have quite the entertainment scope (or positive ratings) of the Gogo app, but at least there’ll be one less drain on your device. Hawaiian Airlines doesn’t just fly island-to-island; the company also offers non-stop flights to 13 mainland US cities, as well as Asia and the South Pacific. Hawaiian’s fleet size is relatively small (under 70 aircraft currently), but its in-flight entertainment options are, as Larry David would say, pretty, pretty, pretty good. Hawaiian offers as much on its entertainment package as some of the bigger airlines, not to mention a healthy portion of Hawaii-specific content. For an additional charge of up to $7.99, the usual lineup of popular movies, TV, games, and music is there for kids and adults. In a nice local touch, there’s the free Hawaiian Skies series of local-interest newsmagazine videos, and the Ola Pono series on island safety, fitness, and cuisine. If you’re not into seat-back viewing, you can stream all of Hawaiian’s entertainment content to your personal devices through the Hawaiian Airlines Entertainment app. There’s no satellite internet access on Hawaiian planes, though; the contained Wi-Fi just works within the cabin for device streaming. Like most of the other airlines, United offers seat-back console entertainment that can also be streamed to your personal devices through the airline’s proprietary app. United also charges near-premium prices for far-from-premium airplane Wi-Fi. Another minus: United advises passengers to “fully charge your device prior to boarding,” because “power outlets are available on select aircraft only.” Ouch. One redeeming quality of United’s in-flight entertainment package is its source: DIRECTV. United features over 100 TV channels from DIRECTV , as well as recent-release movies, and even podcasts if you’re behind on your true-crime stories. You’ll have to pay extra for DIRECTV + Hit Movies, though—$5.99 on flights under two hours, $7.99 on longer flights, or just $4.99 if you purchase in advance. Budget airline Allegiant has flight routes covering most of the US, but none of their planes offer in-flight entertainment or Wi-Fi. Neglect to preload your device with a warm batch of Great British Baking Show episodes at your own peril. 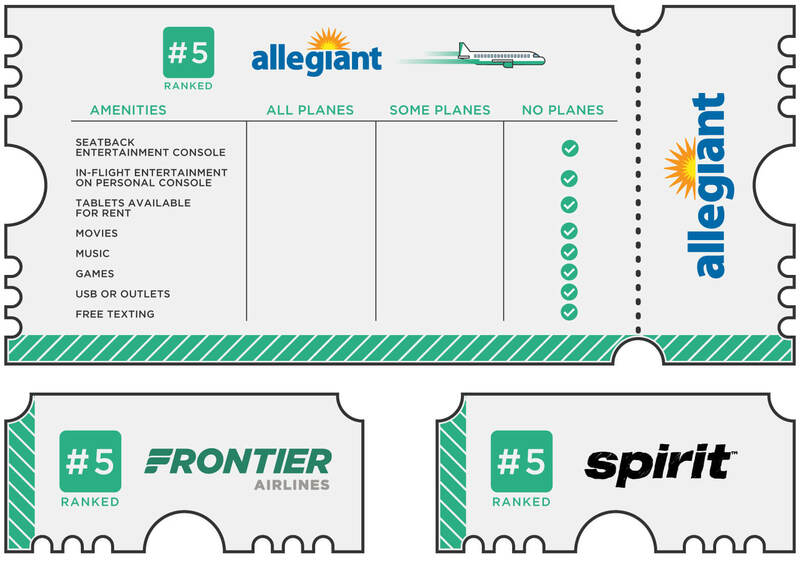 Frontier has more destinations than Allegiant, but the same amount of digital amenities: none. No movies, no TV, no music, no games, and no Wi-Fi. Says Frontier, “We would rather pass the cost savings on to our customers and offer the lowest fares possible!” At least they’re upbeat about it. As with the previous two entries, Spirit Airlines offers no in-flight entertainment options or Wi-Fi. You can, however, bring your small, domesticated dog, cat, or bird onboard with you for an extra $110, so there’s that. On second thought, maybe bring a book. Flying isn’t what it used to be—which is great, no matter what people who romanticize the days when travelers wore business suits instead of track suits say. 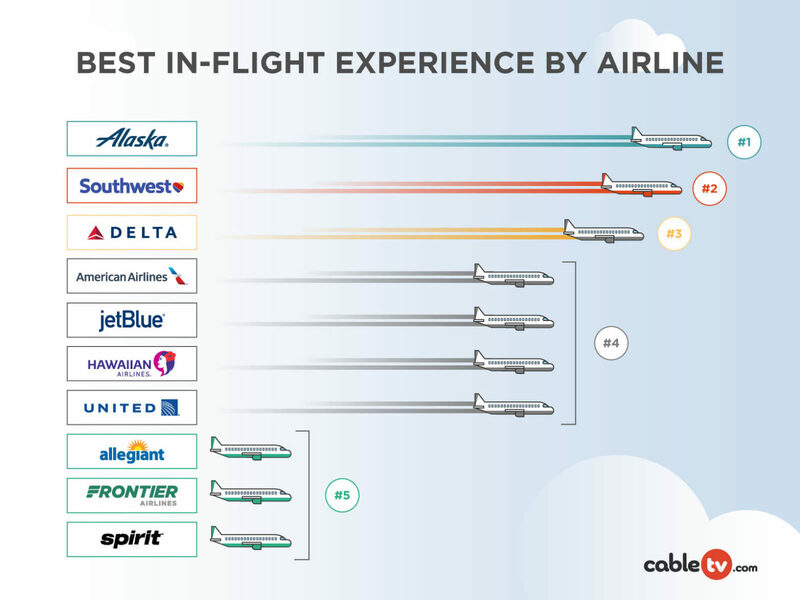 While in-flight entertainment has evolved dramatically since the Mad Men era, some airlines do it better than others; keep CableTV.com’s recommendations in mind when booking your next trip.